Gr1A: A message from our librarian, Teacher Nancy! A message from our librarian, Teacher Nancy! Brontorina knows in her heart that she wants to be a ballerina. Regardless of her size and the fact that she does not have the right shoes, she is determined to dance. The picture storybook is beautifully illustrated and is sure to make your little ballerina smile. Lucy, is the first babysitter that Billy Bear has ever had. Although Billy Bear has a great time with Lucy, there is one thing that prevents him from sleeping...the darkness. He is afraid his mom will not be able to find her way back home in the dark. Nicely written with short sentences; the illustrations fit well with the story. A perfect story for little ones who have never had a babysitter. 3. Velma Gratch & the Way Cool Butterfly by Alan Madison and illustrated by Kevin Hawkes. Velma, a first grader, would like to be remembered at school for being special. After all, her sister Frieda sang "like an angel", and her other sister, Fiona, was a fast runner. What could she possibly do for people to have fond memories of her? In one word... science. Velma enjoyed science. She especially liked butterflies, so she read everything and anything she could find about butterflies. Her most magical moment was when her class went on a field trip to the Butterfly Conservatory. What a gem this story is! I couldn't help but laugh at the way she pronounced the words metamorphosis (metal-more-for-this) and conservatory (can-serve-the-story). The illustrations are beautifully colored and depict very well the emotions that Velma has throughout the story. 4. 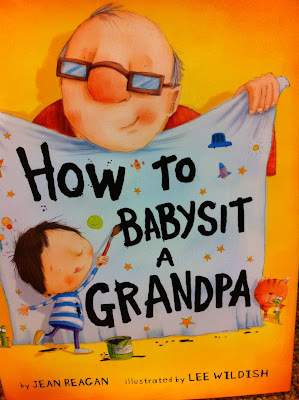 How to Babysit a Grandpa by Jean Reagan and illustrated by Lee Wildish. How does one babysit Grandpa? What kind of activities can Grandpa do? What will Grandpa eat? This story is another little gem. It is a "how-to" story about a little boy getting ready to babysit his grandpa. On every page, there is a "how-to" list of things to do; for example, "Snacks for a grandpa: ice cream topped with cookies, olives served on fingertips, anything dipped in ketchup, cookies topped with ice cream." It is a sweet story about a grandfather-grandchild relationship. Field Trip to the Sugar Bush, this Tuesday!!! Have a great March Break!! !